The Bengaluru Bulls bounced back to winning ways as they clutched on to a big lead in the first half to win 36-22 over the Tamil Thalaivas in the 'Southern Derby' at the Shree Shiv Chhatrapati Sports Complex in Pune. The Bulls came into the contest with a need to sort out the 'home leg conundrum', which seemed to fade away with every minute as the Bulls combined from both departments to pile the misery on the Tamil Thalaivas. Rohit Kumar was the star of the show as he picked up a 'Super 10' and also added a vital tackle point while on the defense front, Amit Sheoran made most of the start awarded to him and picked four tackle points, matching Mahender Singh's four-point effort from the left cover position. For the Thalaivas, substitute Anil Kumar stole the spotlight as he was subbed on early in the first half in place of D Gopu and went on to make raiding difficult for Pawan Sehrawat, finishing with a much deserved 'High-5' from the game. Here are the player ratings for this game. The Thalaivas skipper failed to display his best form as he was kept quiet by the Bengaluru defense unit as he picked just the six raid points from 17 raids on the night. The veteran raider looked solid in the first half as he brought out a classy mix of reverse toe touches and hand touches to pick three points but his good touch went missing in the second half as he finished with only three points. The burly all-rounder was a pale shadow of himself as he was caught off-guard on quite a few occasions by Rohit Kumar but made a good super tackle on Pawan Sehrawat in the second half which gave him the confidence to pick another point, finishing with three tackle points. 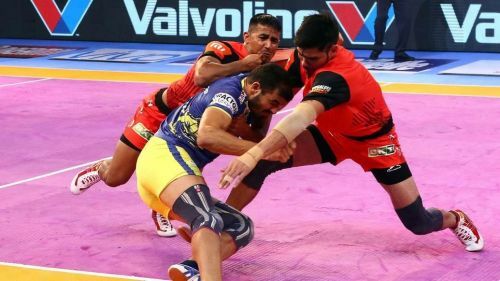 Sukesh Hegde was not in his prime form as he was often brought down by some strong dashes from the Bengaluru Bulls defenders which saw him lose out on his place to Athul MS for the second half. The youngster was awarded a start but failed to make an impact as his two tackles went in vain and gifted easy points to Rohit Kumar while he was also brought down by Amit Sheoran on his two raids. The corner defender looked out of sorts as he made a few errors to gift early points to the Bengaluru Bulls and was subbed off in the first half. The young all-rounder made one too many errors as his poor defensive show saw him finish without a point from four tackles. The right corner defender came in place of D Gopu and was a force to reckon with as his blocks in front of the mid-line earned him a well-deserved High 5. He often had the number of the in-form Pawan Sehrawat, who was brought down on three occasions by the right corner. The lanky raider came in place of Sukesh Hegde in the second half and picked up two points, including one bonus point. The experienced raider came off the benches in the second half but failed to make an impact as he was dashed out on the Do or Die raid. C Arun was subbed on as a hopeful candidate to make some vicious tackles but the right corner was quiet all throughout the game and failed to pick a single point.